The Baltic Exchange is the provider of information on maritime transportation markets, used for the trading and settlement of physical and derivative contracts. It was located at 24–28 St Mary Axe, London, until that building was destroyed by a bomb in 1992, and is now located at 38 St Mary Axe. It has further offices in Europe and across Asia. Its international community of over 600 member companies encompasses the majority of world shipping interests and commits to a code of business conduct overseen by the Baltic. Baltic Exchange members are responsible for a large proportion of all dry cargo and tanker fixtures as well as the sale and purchase of merchant vessels. The company was founded in the mid-19th century, with leading founding shareholders being Stephen Ralli and Michael Rodocanachi, whose families were from the Chian Diaspora. The first use of the name was at the Virginia and Baltick Coffee House in Threadneedle Street in 1744, and was registered as a private limited company with shares in 1900. Today the exchange is owned by its member companies and is not publicly traded on a stock exchange. It is governed by a member-elected Board of Directors. The exchange provides daily freight market prices and maritime shipping cost indices which are used to guide freight traders as to the current level of various global shipping markets as well as being used to set freight contract rates and settle freight futures (known as Forward Freight Agreements or FFAs). Originally operating a trading floor, the exchange's members' transactions are today done solely over the telephone or on broker-owned screens. The exchange also provides forward curves, a dry cargo fixture list, sale and purchase values, LPG assessment, daily market news and the market settlement data for freight derivative contracts. 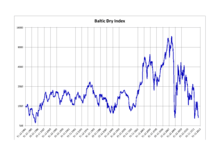 BIFFEX, the Baltic International Freight Futures Exchange, was a London-based exchange for trading ocean freight futures contracts with settlement based on the Baltic Freight Index. It started trading dry cargo freight futures contracts in 1985, and was modestly successful for some years. All contracts were cleared by the ICCH (International Commodity Clearing House), later renamed LCH.Clearnet (London Clearing House). A tanker freight futures contract was introduced in 1986, but never became popular and was suspended indefinitely the same year. Volumes in the dry cargo contracts dwindled over the years, and the contracts ceased trading due to lack of liquidity in 2001. The exchange was located at 24–28 St Mary Axe, London until that building was destroyed by a bomb in 1992, and is now located at 38 St Mary Axe, London. It has further offices in Europe and across Asia. ↑ "Greek Migrations: Phanariot, Chian and other Families and the Secrets of their Success". Retrieved 22 November 2012. ↑ CNBC (2016-09-26). "Baltic Exchange names Mark Jackson as new CEO". CNBC. Retrieved 2016-09-26.